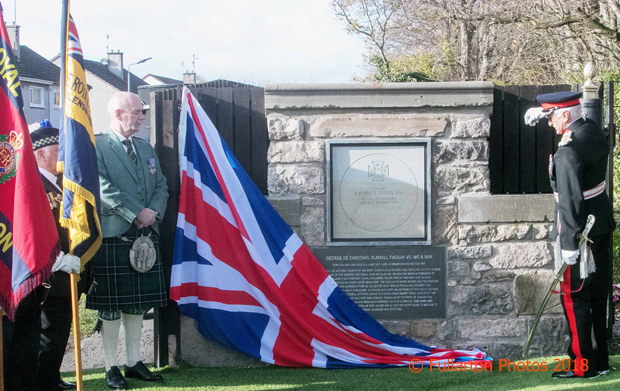 One hundred years to the day since that act of bravery, a memorial plaque was unveiled at the gates of Drumfork House in Colgrain, where Colonel Findlay (pictured below left) lived for more than 40 years until his death in 1967. Drumfork House is believed to be the burgh's oldest mansion, and he moved there with his mother when the family home at Boturich on Loch Lomondside passed to another member of the family. Family members from as far away as Canada attended the ceremony, which marked the completion of four years of work behind the scenes by Argyll and Bute Council, Norman Muir, chairman of Helensburgh Community Council, and Drumfork House’s present owner, Kevan O’Neill, to have Colonel Findlay’s bravery honoured with a permanent memorial. 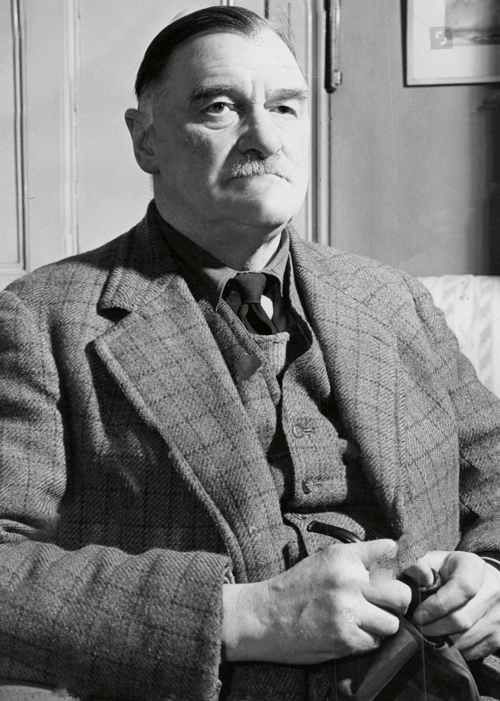 His great-nephew, Charles Findlay, said: “I think it’s great that we are remembering the Colonel, although I’m sure he would be telling us about all the others who did not win medals and who did not come home. "George's closest relative, my aunt, travelled from Ottawa with her grand-daughter to be present at the event. 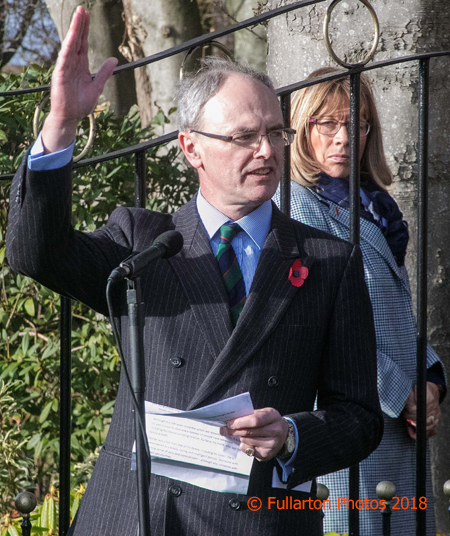 It was touching to see the number of Helensburgh people who came along to pay their respects, including a group of pupils from Lomond School who are studying the First World War as part of their syllabus." 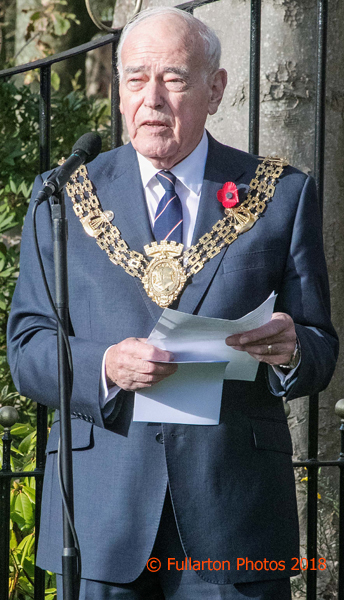 A Royal Engineers guard of honour, members of the Royal British Legion Scotland and the Royal Engineers Association, and local residents looked on as Provost Len Scoullar of Argyll and Bute Council opened the proceedings. 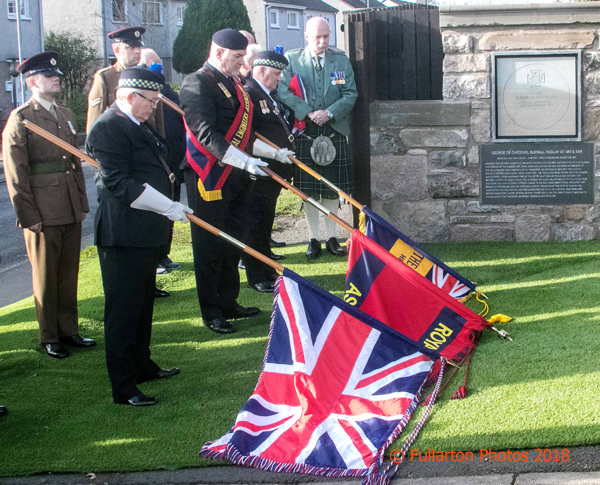 The Victoria Cross citation was read out, the Lord Lieutenant of Dunbartonshire, Rear Admiral Mike Gregory OBE, unveiled the plaque, and prayers were led by the Rev David T.Young of Helensburgh Parish Church. 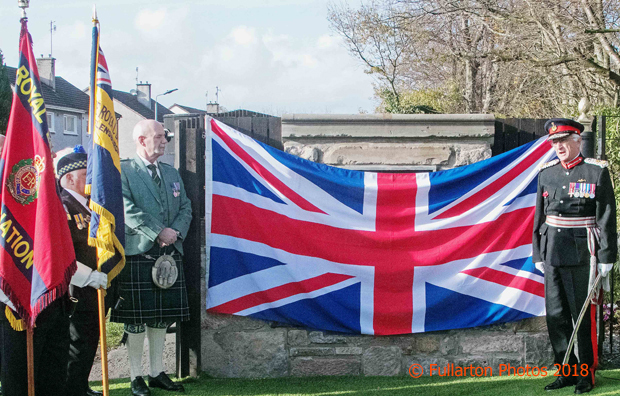 The flags were lowered as a Royal Engineers bugler played the Last Post, then wreaths were laid by Mrs Michael Hicks, Colonel Findlay's niece, Robert Kerr, his great nephew, and Colonel Quare on behalf of the Corps. Official guests included local MSP Jackie Baillie, Argyll and Bute Council leader Councillor Aileen Morton, and Helensburgh and Lomond Area Committee chairman Councillor Ellen Morton. Afterwards a civic reception was given by the Council in Helensburgh and Lomond Civic Centre in East Clyde Street. 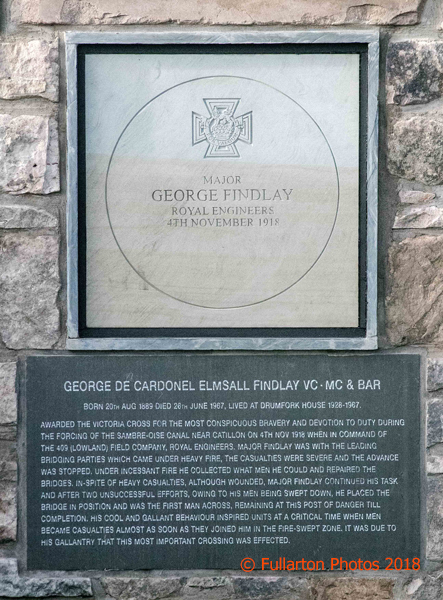 The story of Colonel Findlay's amazing military career and later service as the Cardross and Craigendoran representative on Dunbartonshire County Council can be read here. Provost Len Scoullar opens the ceremony. 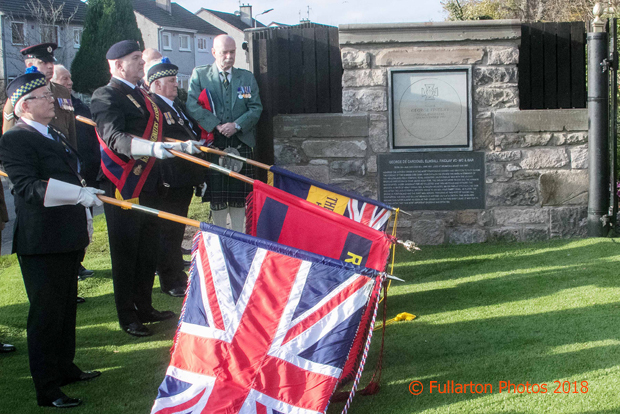 Relatives and friends hear the Provost's tribute to Colonel Findlay. 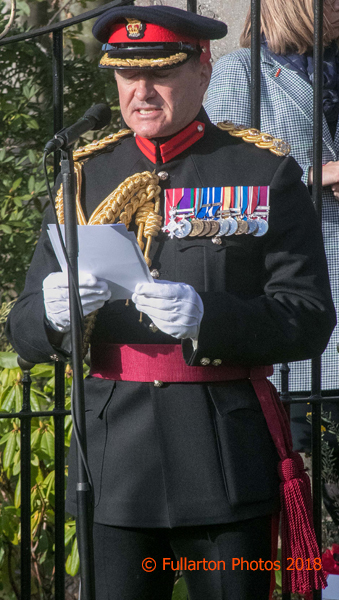 The Victoria Cross citation is read by Colonel Matt Quare, MBE, ADC, Corps Colonel, Royal Engineers. 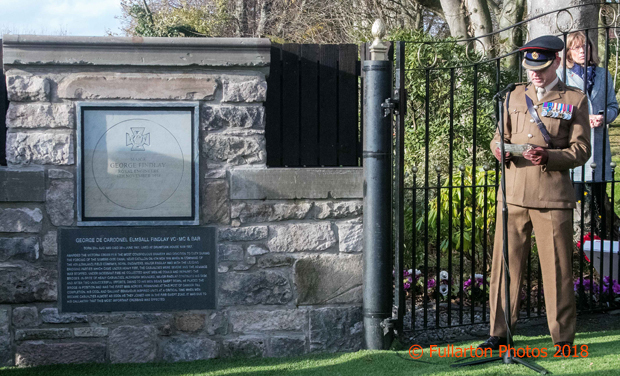 The Lord Lieutenant of Dunbartonshire, Rear Admiral Mike Gregory, prepares to unveil the memorial plaque. 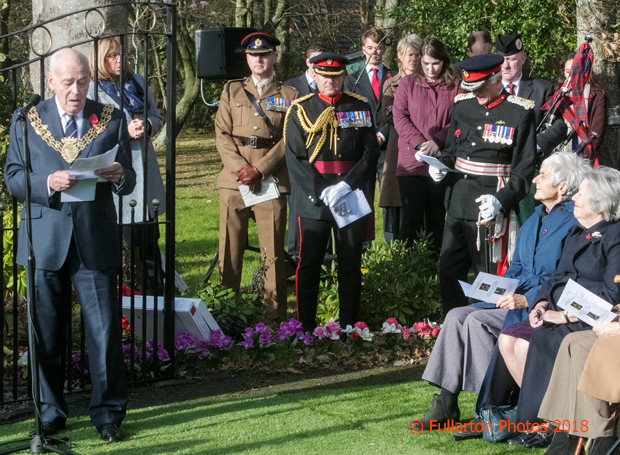 The Lord Lieutenant unveils the memorial plaque. Major Mick Stewart, 102 Field Squadron Royal Engineers, tells how the Victoria Cross was won. The standard bearers lower the standards as the Last Post sounds. The standards lowered for the Last Post. Charles Findlay speaks on behalf of the family.